Sails appear to be in reasonable condition for their age. The hull is Kevlar reinforced in key points. This makes for exceptional strength and impact resistance, without the maintenance and weight problems associated with steel hulls. Captive winches for all major applications, for ease of handling. Anchor deploys from bow, keeping the deck free of clutter. She is equipped with a Bose audio - visual systems. 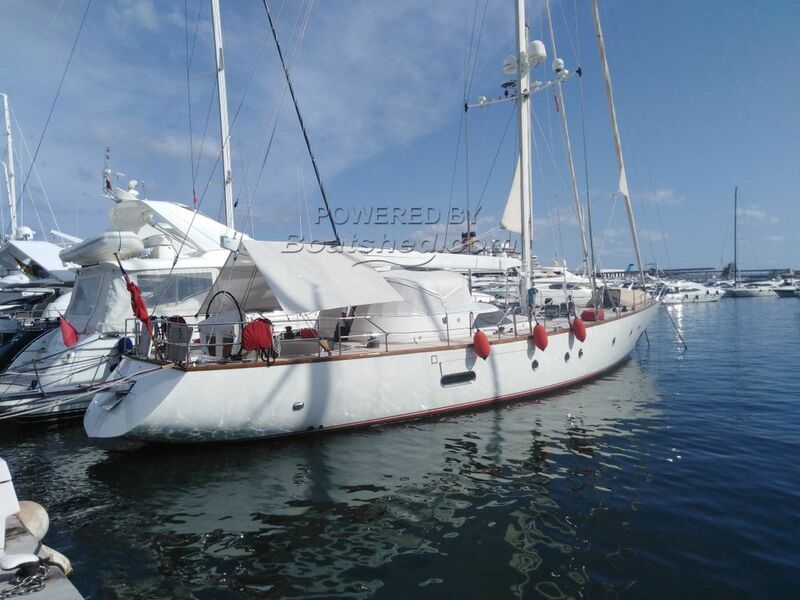 She also has the capacity for satellite communications, for Ocean sailing. Boat has salvage pump capacity. This is a unique yacht, designed and built for the founder of the Perini Navi yard in 1987. Professionally maintained and upgraded throughout, she offers great space and luxury, within classic lines. She offers fingertip control of all major functions. This, coupled with the use of captive winches and bow thruster, enable short - handed sailing, manouevering and mooring. As a testament to this, she has been run with only one crew member for the last 2 years. This Custom Sloop has been personally photographed and viewed by Rory Gillard of Boatshed Palma. Click here for contact details.